After my nut milk expose, I was prepared to test many Costco products against Aldi, and expected to find Aldi winning. 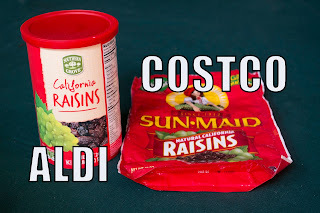 I ran out of Costco Sun-Maid raisins, hard to believe because I thought I had a lifetime supply (I freeze the ones I'm not using), so I tried the Aldi product. How different could raisins be? Turns out, pretty different. The Sun-Maid raisins were plumper, which I expected because of more expensive processing, but, since I use them in cooking, I didn't think plumpness would matter. They plump up when cooked. But the taste of the Costco product was definitely better. The generic Aldi brand raisins were slightly sweet, but mostly sour. The Sun-Maid raisins had a sweet but complicated taste, like good wine. 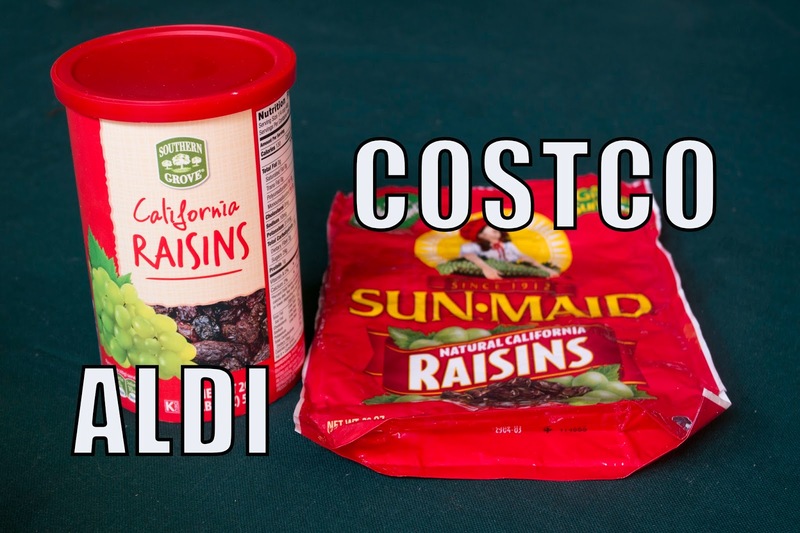 In this taste test, Costco Sun-Maid won.